After negotiations fell apart last night, Seattle teachers will be on strike to begin their school year today. We send out thoughts of support and solidarity to our sisters and brothers in the SEA! 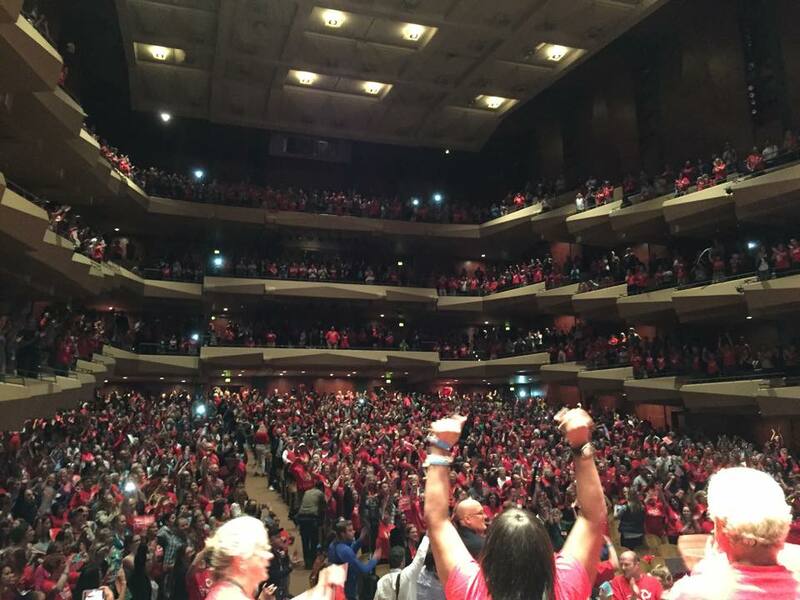 Seattle teachers unanimously vote to authorize a strike. The Seattle Education Association is ready to strike tomorrow, on the first day of school in their district, if negotiations tonight do not reach an agreement. In a situation reminiscent of the Chicago Teachers Union’s 2012 strike, the teachers in Seattle are ready to strike for more than just typical “bread and butter” union issues. While things such as salary increases and length of work day are part of negotiations, the negotiating team in Seattle has also made demands to reduce high stakes testing, address structural inequities, and increase recess time for students who have continually had recess time dwindle all while they have been besieged by increasing amounts of test prep. MY NAME is Dan, and I have been teaching in some form or another for 15 years. My union, the Seattle Education Association (SEA), is currently in negotiations with Seattle Public Schools and recently voted unanimously to authorize a strike for the first day of school if we cannot reach an agreement with the school district. The mood in our union is angry and defiant. Educators have been pushed around for a long time, and many have just had enough. Our strike is about respect. It’s about fairness. But more than anything, it’s about redefining the narrative around public education and reasserting the voice of educators in how public education is shaped going forward. During the discussion on the strike question, many members began supportive remarks with a disclaimer along the lines of “I don’t want to strike, but…” I understand the sentiment behind that phrase. Teachers are a dedicated bunch. We sacrifice our time (in the form of many unpaid hours) and invest a huge amount of emotional energy worrying about our students. It’s a fact so many people are aware of that it easily belies the corporate education reform game of shaming teachers. Yet I have to say that I want to go on strike. Just walking an info picket line the other day, I saw many students and rejoiced seeing them after being apart for the summer. And yet, I think of how the Washington state legislature consciously ignored the mandates of the state Constitution and a state Supreme Court decision to fully fund education for years. I think of how supports for struggling students, such as counselors and even summer school, have been cut. I think of the massive ranks of amazing educators I’ve known over the years who have either left the profession or been forced out by cold, draconian administrators. The SEA hasn’t been on strike in 30 years. The problem with that is that people forget. We forget about the power we have to change these things. And our employers forget, too. WHEN I think of going on strike, I think of some of my struggling students whose parents lost their job and had to move just as I was getting through to them. I think about some whose parents were unexpectedly deported and were suddenly homeless. And I think of many of my students who live with the daily realities of oppression, whether it be from racial profiling or homophobic teasing. I think of what it will take to change these much larger issues, and my resolve is bolstered a thousandfold. This is because of a fundamental reality: that collective struggle is the most powerful means of making change–not simply because it marshals and coordinates the main power that ordinary, working people have, but because it requires people to work together and depend on each other with such urgency that they begin to overcome divisions among themselves and can for the first time really envision the possibilities of much larger change. Ignoring this important lesson has proven disastrous for the labor movement. It is no coincidence that unions are experiencing their lowest membership numbers in 70 years now, at the same time that the number of strikes is at an all-time low. The last time that the SEA negotiated, the union wasn’t prepared for a strike, and we ended up with a contract that included the same inequitable and inaccurate growth ratings based on student test scores in our evaluations–exactly what we are currently trying to remove. During our strike vote, many people talked about having trust in the negotiating team and the elected leadership. Indeed, those groups have shown more resolve recently than in previous bargaining. But to me, the strength in the union isn’t trust in anyone having elected me, but trust in all the members of that union having the courage to stand together. Because, again, that’s the most powerful way we can change things for the better. This is so important, particularly now when our politicians are so out of touch and misrepresent us so badly that many people seem desperate to find among any of the candidates who would deliver some change. They miss the important reality that the ones we can look to are all around us–that we don’t need politicians to represent us when we have the power, if it is organized and mobilized. So I want to strike. For my students, for our future and for a change. This entry was posted in General and tagged "public education", Hagopian, SEA, SEE, strike, Troccoli. Bookmark the permalink. 3 Responses to Seattle Teachers On Strike! Wow. Love his blog. Looks like there is a lot going on in Seattle. Check out my blog scientificbabble. I hope you enjoy it.